Welcome interested possible-affiliates! On this page you can get more information on the ebook affiliate program. 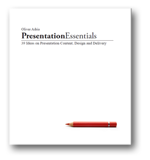 If you really liked the eBook “Presentation Essentials – 39 Ideas on Presentation Content, Design and Delivery” and you want to sell it on your blog or web site (and make money while doing so! ), then you’ve come to the right place. I offer descriptions, images, banners which you can use for your own blog, website or email newsletters. What’s in it for me, the affiliate?? Affiliates will get 50% (yes, half!!) of the income generated through the sales via their web site. But it gets better! If you sold more than 10 in total, this will increase to 55% starting in the following month! If you have sold more than 50 eBooks in total, this will increase to 60% in the following month! Yes, all you need to do is promote the eBook on your website or newsletter and sell enough eBooks and you will actually get 50% more than I do selling these books (60% of the price for you vs. 40% of the price for me) – and you don’t have to pay any hosting or selling fees! If you have sold more than 10 eBooks, you can also request a limited-time discount code of up to 10% off the sale price for the visitors of your blog/website! So your blog visitors will get “preferred” treatment if they buy the eBook. You will get the payout within 2 weeks after the end of each month (e.g. if you sold eBooks in August, you will receive the money by September 15th). To start selling the eBook on your blog or web site and get 50% of the sales via your website click here on the Affiliate Sign Up Link! Customers that come via your blog/website and want to buy the book can pay via PayPal or Credit Card or bank account (where available). To get you started, below is a template for your blog/website/newsletter which you can use to promote the book. 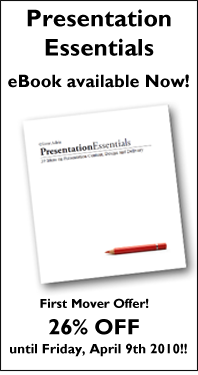 The eBook “Presentation Essentials – 39 Ideas on Presentation Content, Design and Delivery” gives the beginning and intermediate presenter the necessary skills to improve their presentation dramatically. Often, it is just a few tweaks (e.g. re-thinking about the purpose of the presentation or distilling the core message of the presentation at the beginning) that will make the presentation stand out! This eBook is divided into 5 chapters: “General, Content, Design, Delivery, Motivation” to cover all of the aspects to increase the effectiveness of presentations! 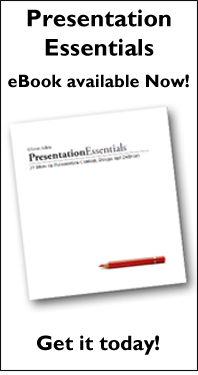 In about 90 pages this book covers many aspects of presentations that you need to know – from Idea 8 on creating a storyline to Idea 30 on preparing for the worst. Each idea is 1-3 pages long and easy to digest, so you can have a quick read whenever you need to! Want to get started and work towards those 60%! click here on the Affiliate Sign Up Link!